Henri Jozef Machiel Nouwen, (Nijkerk, January 24, 1932 – Hilversum, September 21, 1996) was a Dutch Catholic priest, professor, writer and theologian. His interests were rooted primarily in psychology, pastoral ministry, spirituality, social justice and community. Over the course of his life, Nouwen was heavily influenced by the work of Anton Boisen, Thomas Merton, Rembrandt, Vincent van Gogh and Jean Vanier. After nearly two decades of teaching at academic institutions including the University of Notre Dame, Yale Divinity School and Harvard Divinity School, Nouwen went on to work with mentally and physically handicapped people at the L'Arche Daybreak community in Richmond Hill, Ontario. From 1966 to 1968 he was a visiting professor at the University of Notre Dame. From 1968 to 1970 he worked at the Amsterdam Joint Pastoral Institute and taught psychology and spirituality at the Catholic Theological Institute in Utrecht. In 1971 he received his doctorandus degree in theology. After leaving Yale in 1981, Nouwen took a six-month trip to South America visiting Bolivia and Peru. Upon his return to the United States in 1983, Nouwen was appointed at the Harvard Divinity School as Professor of Divinity and Horace De Y. Lentz Lecturer. The half-time appointment allowed Nouwen to split his time between teaching at the Divinity School and working with a theological center in Latin America. Nouwen taught at the school until his resignation in 1985. In 1985 and 1986 he spent nine months with the L'Arche community in France. During Nouwen's time in France he traveled to Toronto, Ontario to officiate a wedding and sought permission to stay for a week at L'Arche Daybreak in Richmond Hill. While there a core member named Raymond was hit by a car and left in critical condition. Nouwen provided spiritual guidance to the community and Raymond’s family, ultimately helping to reconcile the community and the family, who partially blamed Daybreak for Raymond's injuries. Nouwen's intervention had such an impact the Daybreak members asked him to serve as their pastor. Nouwen accepted and moved in the fall of 1986 to L'Arche Daybreak, where he would spend the last ten years of his life. While at Daybreak Nouwen was paired with Adam Arnett, a core member at L'Arche Daybreak with profound developmental disabilities. Nouwen wrote about his relationship with Arnett in a book titled Adam: God's Beloved. Nouwen struggled with his sexuality, which may have contributed to his feelings of self-doubt. :80 Although this struggle was known by those close to him, Nouwen never publicly identified as homosexual despite acknowledging the matter in discussions with friends and alluding to a personal struggle in his private journals. Biographer Michael Ford referenced these instances in the biography Wounded Prophet, which was published after Nouwen's death. Ford suggests that Nouwen only became fully comfortable with his sexual orientation in the last few years of his life, and that Nouwen's depression was caused, in part, by the conflict between his priestly vows of celibacy and the sense of loneliness and longing for intimacy that he experienced. "This took an enormous emotional, spiritual and physical toll on his life and may have contributed to his early death." There is no evidence that Nouwen ever broke his vow of celibacy. Nouwen died on September 21, 1996 from a sudden heart attack in the Netherlands. At the time he was en route to Russia to participate in a Dutch documentary about his book The Return of the Prodigal Son. Nouwen's first funeral Mass was held on September 24 at St. Catherine's Cathedral in Utrecht with a eulogy offered by Jean Vanier, after which Nouwen's body was flown to Canada for burial by the L'Arche Daybreak community. The second funeral Mass was held on September 28 at the Slovak Catholic Cathedral of the Transfiguration in Markham, Ontario, following a full day wake at St. Mary Immaculate Catholic Church in Richmond Hill on September 27. Nouwen was laid to rest in a pine coffin built in L'Arche Daybreak's The Woodery and colourfully painted by members of the community. He is buried in St. John's Anglican Church Cemetery in Richmond Hill in keeping with his desire to be near the graves of other Daybreak community members. 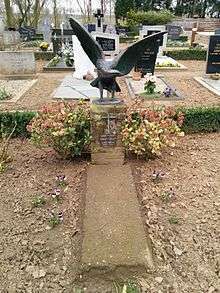 There is also a memorial marker for Nouwen in Geysteren, NL at the grave site of his parents. Prior to his death he entrusted Sue Mosteller, C.S.J. with his estate, making her the literary executrix of his works. The founding of the Henri J.M. Nouwen Archives and Research Collection at the John M. Kelly Library, University of St. Michael's College was the culmination of Mosteller's effort to centralize Nouwen's personal records. The work involved organizing his material at L'Arche Daybreak, which included personal correspondence, original manuscripts, and audio visual material, and negotiating with the Yale Divinity School Library for the release of records Nouwen had begun depositing there as a faculty member in 1975.:19 The Nouwen Archives opened in September 2000. He has an award named for him, the Henri Nouwen Leadership Award, given out by the American Association on Intellectual and Developmental Disabilities Religion and Spirituality Division. There is also an elementary school named after him in Richmond Hill, Ontario. "Terugkeer van de Verloren Zoon" by Rembrandt Harmenszoon van Rijn. 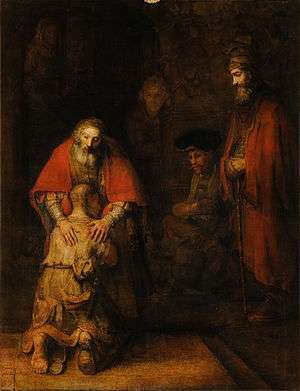 Nouwen wrote a short book, The Return of the Prodigal Son, based on his contemplation of Rembrandt's painting of the same name. Before his death Nouwen published 39 books and authored hundreds of articles. :9 His books have sold over 7 million copies worldwide and have been published in more than 30 languages. :3 In a magazine survey conducted by Christian Century in 2003 Nouwen's work was indicated as a first choice of authors for Catholic and mainline Protestant clergy. His books include The Wounded Healer, In the Name of Jesus, Clowning in Rome, The Life of the Beloved and The Way of the Heart, along with what is recognized as one of his most popular books, The Return of the Prodigal Son. While visiting the L'Arche Trosly-Breuil community in France, he saw a poster of Rembrandt's painting The Return of the Prodigal Son, that made a deep impression on him. He decided to see the painting personally and traveled to Saint Petersburg (Leningrad at that time) to visit the Hermitage Museum where it is kept. This resulted in a several day contemplation of the painting, which prompted him to write a book of the same name. The Return of the Prodigal Son was ranked number 66 on a list of 100 best Christian books compiled by the Church Times in 2014. I wanted to know how we could integrate the life of Christ in our daily concerns. I was always trying to articulate what I was dealing with. I thought that if it was very deep, it might also be something other people were struggling with. It was based on the idea that what is most personal might be the more universal. One of Nouwens' major ongoing themes involved his struggle reconciling his depression with his Christian faith. His most famous work on this topic is the Inner Voice of Love, his diary from December 1987 to June 1988 during one of his most serious bouts with clinical depression. Nouwen also explored this theme in Return of the Prodigal Son, describing love and forgiveness as unconditional. In the book, he invites the reader to follow him in his personal return to the spiritual fountains, and a parallel meditation on all the characters of the parable, and their rendering by Rembrandt, and the painter's personal life. Nouwen also wrote several essays on the necessity of peacemaking. He used God's Love as a justification for the preservation of life, as well as his opposition to both the ongoing Cold War and the intervention of the United States in Vietnam. His struggle to reconcile his priestly vows of celibacy with his human desire for physical and emotional intimacy was also a theme in his writings. Nouwen was a frequent public speaker. In addition to his teaching responsibilities, he traveled extensively leading retreats and sermons. With a distinct accent and animated speaking style, Nouwen was known for his engaging and expressive style of communication. The experience of seeing him preach has been compared to being at the theater or seeing a musical conductor at work. :31 It was not uncommon for Nouwen to enthusiastically jump around or wave his arms and hands during speaking events and classroom lectures. :80:xxiv Bob Massie describes the experience of watching Nouwen speak in Befriending Life (2001): "His squeezing, tugging gestures made it look like he was striving to milk meaning directly out of the air. He would point his fingers down and rotate his wrists as through trying to stir a separate little pot with each digit." Nouwen held appeal to many audiences, including Anglicans and Evangelicals because of his Jesus-centered spirituality. In 1992 he was invited by Robert H. Schuller to preach on Hour of Power at the Crystal Cathedral in Garden Grove, California. Nouwen appeared over three consecutive Sundays and preached on the topic of belovedness. Recordings of his appearance were later used by Schuller as a model for preaching when instructing new ministers. Bengtson, Jonathan; Earnshaw, Gabrielle, eds. (2006). Turning the wheel : Henri Nouwen and our search for God. Maryknoll, NY. : Orbis Books. OCLC 123485283. Beumer, Jurjen (1997). Henri Nouwen : a restless seeking for God. New York: Crossroad Pub. Co. ISBN 9780824517687.
de Vinck, Christopher, ed. (1999). Nouwen then : personal reflections on Henri. Grand Rapids, Mich.: Zondervan. ISBN 9780310224624. Ford, Michael (1999). Wounded Prophet : A Portrait of Henri J.M. Nouwen. New York: Doubleday. ISBN 9780385493727. Hernanez, Wil (2006). Henri Nouwen: A Spirituality of Imperfection. New York: Paulist Press. ISBN 9780809144341. Higgins, Michael W.; Burns, Kevin (2012). Genius Born of Anguish: The Life & Legacy of Henri Nouwen. Toronto, Canada: Novalis. ISBN 9780809147854. LaNoue, Deirdre (2000). The Spiritual Legacy of Henri Nouwen (1st ed.). New York: Continuum. OCLC 44469051. O'Laughlin, Michael (2004). God's Beloved : A Spiritual Biography of Henri Nouwen (1st ed.). Maryknoll, N.Y.: Orbis Books. ISBN 9781570755613. O'Laughlin, Michael (2005). Henri Nouwen: His Life and Vision (1st ed.). Maryknoll, N.Y.: Orbis Books. ISBN 9781570758225. Porter, Beth (ed. ); Susan M.S Brown; Philip Coulter (June 26, 2001). Befriending Life: Encounters with Henri Nouwen. Doubleday. ISBN 978-0-385-50202-3. Twomey, Gerald S.; Pomerleau, Claude, eds. (2006). Remembering Henri : the life and legacy of Henri Nouwen. Maryknoll, NY. : Orbis Books. OCLC 68220900. Callahan, Annice (1992). "Prophet of conversion / Henri Nouwen (1932- )". Spiritual guides for today : Evelyn Underhill, Dorothy Day, Karl Rahner, Simone Weil, Thomas Merton, Henri Nouwen. New York: Crossroad. p. 176. ISBN 9780824511098. Smith III, James D. (2006). "Christian spirituality envisioned : a pastoral appreciation of Ernst Kitzinger, Margaret Miles, and Henri Nouwen (Harvard, 1976-85)". In Richard Valantasis; Deborah J. Haynes; James D. Smith III; et al. The subjective eye : essays in culture, religion, and gender in honor of Margaret R. Miles. Pickwick Publications. OCLC 70277239. Trenn, Thaddeus J. (September 2006). "Science and the Mystery of the Human Person" (PDF). Journal of the American Scientific Affiliation. 58 (3): 216–224. 1 2 3 4 O'Laughlin, Michael (2005). Henri Nouwen: His Life and Vision (1st ed.). Maryknoll, N.Y.: Orbis Books. ISBN 9781570758225. 1 2 3 4 Beumer, Jurjen (1997). Henri Nouwen : a restless seeking for God. New York: Crossroad Pub. Co. ISBN 9780824517687. ↑ Wahle, Hedwig (1997). "Some known and unknown Pioneers of Continental Europe". SIDIC. Rome: Service International de Documentation Judéo-Chrétienne. Retrieved February 9, 2015. 1 2 3 4 5 6 Ford, Michael (1999). Wounded prophet : A Portrait of Henri J.M. Nouwen. New York: Doubleday. ISBN 9780385493727. ↑ "Ordination certificate" (July 21, 1957) [textual record]. Henri Nouwen fonds, Series: Nouwen's education records and study notes - School certificates - Diplomas, Box: 375, File: 364. Toronto, ON: The Henri J.M. Nouwen Archives and Research Collection, University of St. Michael's College. 1 2 3 4 Jonas, Robert A., ed. (2009). The Essential Henri Nouwen. Boston ; London: Shambhala. ISBN 9781590306642. 1 2 3 4 O'Laughlin, Michael (2004). God's Beloved : A Spiritual Biography of Henri Nouwen (1st ed.). Maryknoll, N.Y.: Orbis Books. ISBN 9781570755613. ↑ "Completion of Clinical Pastoral Training certificate" (March 1965) [textual record]. Henri Nouwen fonds, Series: Nouwen's education records and study notes - School certificates - Diplomas, Box: 375, File: 364. Toronto, ON: The Henri J.M. Nouwen Archives and Research Collection, University of St. Michael's College. ↑ "Graduate Training Program in Theology and Psychiatric Theory certificate" (June 19, 1965) [textual record]. Henri Nouwen fonds, Series: Nouwen's education records and study notes - School certificates - Diplomas, Box: 375, File: 364. Toronto, ON: The Henri J.M. Nouwen Archives and Research Collection, University of St. Michael's College. ↑ Schaeffer, Pamela (October 4, 1996). "October 4, 1996". National Catholic Reporter. Retrieved 16 September 2015. 1 2 Genesee Diary: Report from a Trappist Monastery (1st ed.). Garden City, N.Y.: Doubleday. 1976. ISBN 9780385113687. ↑ A Cry For Mercy: Prayers from the Genesee (1st ed.). Garden City, N.Y.: Doubleday. 1981. ISBN 9780385175074. ↑ Durback, Robert (1989). Seeds of Hope : A Henri Nouwen Reader (1st ed.). Toronto ; New York: Bantam Books. ↑ "25th ordination anniversary invitation" (1982) [textual record]. Henri Nouwen fonds, Series: Calendar files, Box: 188, File: 889. Toronto, ON: The Henri J.M. Nouwen Archives and Research Collection, University of St. Michael's College. ↑ Nouwen, Henri (1993). Gracias! : A Latin American Journal. Orbis Books. ISBN 0883448513. ↑ "Letter to friends announcing resignation" (July 6, 1985) [textual record]. Henri Nouwen fonds, Series: Teaching materials, Box: 284, File: 2271, pp. 1. Toronto, ON: The Henri J.M. Nouwen Archives and Research Collection, University of St. Michael's College. ↑ Burback, Robert, ed. (December 29, 1997). "Henri Nouwen: The Person". Seeds of Hope: A Henri Nouwen Reader. Doubleday. ISBN 978-0-385-49049-8. ↑ Jonas, Robert A., ed. (1998). Henri Nouwen: Writings. Maryknoll, N.Y.: Orbis Books. ISBN 9781570751974. ↑ Mosteller, Sue (December 29, 1997). "Funeral Eulogy for Henri Nouwen". In Durback, Robert. Seeds of Hope: A Henri Nouwen Reader. Doubleday. ISBN 978-0-385-49049-8. ↑ Egan, Joe (December 4, 1985). "Letter from Joe Egan". University of St. Michael's College Collections. The Henri J.M. Nouwen Archives and Research Collection. Retrieved January 5, 2015. ↑ Nouwen, Henri J.M. (1997). Adam: God’s Beloved (1st ed.). Maryknoll, N.Y.: Orbis Books. ISBN 9781570759949. 1 2 Gibson, David (2004). The Coming Catholic Church: How the Faithful Are Shaping a New American Catholicism. HarperCollins. p. 191. ISBN 978-0-06-058720-8. Retrieved March 31, 2008. 1 2 McGinley, Dugan (2004). Acts of Faith, Acts of Love: Gay Catholic Autobiographies as Sacred Texts. Continuum International Publishing Group. pp. 185–186. ISBN 978-0-8264-1836-4. Retrieved March 31, 2008. ↑ Elford, R. John (2003). The Foundation of Hope: Turning Dreams Into Reality. Liverpool University Press. p. 72. ISBN 978-0-85323-519-4. Retrieved March 31, 2008. ↑ Dear, John (October 11, 1996). "'Sleep well,' friends tell Henri Nouwen". National Catholic Reporter. p. 13. Retrieved 16 September 2015. ↑ Geisterfer, Michael R. (October 18, 1996). "A wounded healer goes home". Christian Courier. He was buried in a simple pine box. They made it in the L'Arche woodery during the week they waited for his body to be flown in from the Netherlands. The coffin was painted with colourful steams and flowers and a child-like depiction of Christ on the cross which would lie over Henri's heart when finally closed. ↑ "Henri Nouwen's Gravesite". Henri Nouwen Society. Retrieved 5 August 2015. ↑ Black, Shannon (September 21, 2000). "Works of priest who inspired Hillary Clinton open to public". National Post. Retrieved 24 September 2015. 1 2 3 Earnshaw, Gabrielle (2011). The Henri J.M. Nouwen Archives and Research Collection. John M. Kelly Library, University of St. Michael's College. 1 2 McCarthy, Gerry. "Nouwen Archive reveals depth of his interest in people". National Catholic Reporter Online. National Catholic Reporter. Retrieved 16 June 2015. ↑ Carroll, Jackson W. (August 23, 2003). "Pastors' Picks: What Preachers are Reading". Christian Century. 120 (17): 31. ISSN 0009-5281. ↑ Walsh, Brendan (October 5, 1996). 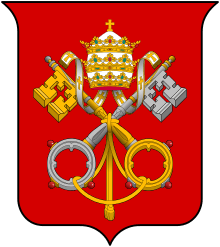 "Obituaries: The Rev Henri Nouwens". independent.co.uk/. The Independent. Retrieved July 20, 2015. These last years at Daybreak produced some of Nouwen's finest work, books like The Road to Daybreak (1988) and The Return of the Prodigal Son (1992). ↑ "100 best Christian books". Church Times. 2014. Retrieved November 12, 2014. ↑ LaNoue, Deirdre (2000). The Spiritual Legacy of Henri Nouwen (1st ed.). New York: Continuum. OCLC 44469051. ↑ Massie, Bob (June 26, 2001). "God's Restless Servant". In Porter, Beth; Susan M.S Brown; Philip Coulter. Befriending Life: Encounters with Henri Nouwen. Doubleday. p. 10. ISBN 978-0-385-50202-3. ↑ "Awards of Excellence Gala". Ronald McDonald House Charities. Retrieved 24 June 2015.